Gartner, the world's foremost authority on IT research and advisory, has released its 2016 Magic Quadrant¹ for General-Purpose Disk Arrays² report in which Huawei was named as a leader. A vendor in the Leaders quadrant has the market share, credibility, and marketing and sales capabilities needed to drive the acceptance of new technologies. These vendors demonstrate a clear understanding of market needs, they are innovators and thought leaders, and they have well-articulated plans that customers and prospects can use when designing their storage infrastructures and strategies. Huawei meets all these criteria. In addition, they have a presence in the five major geographical regions, consistent financial performance and broad platform support. Huawei Storage has been included in the Gartner report since 2010. In September 2016, Huawei announced its new 'Data on Demand' vision. The product strategy aims to build converged resource pools in cloud-ready data centers and integrate infrastructures, enabling sharing of data across different types of services and providing customers with the automation and on-demand provisioning capabilities they require to make the move to the cloud more agile. With technological innovations providing the momentum, Huawei has formed a strong presence in the enterprise storage and cloud storage fields. 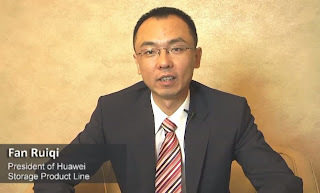 Huawei has moved to the forefront of product evolution strategies geared to the future powered by OceanStor OS that abstracts the differences in hardware at the underlying layer and interworks with various protocols and equipment types as well as the service-driven OceanStor DJ orchestrator that is able to intelligently match the optimal resources to the use case, helping customers cope with the uncertainties in their cloud adoptions. Huawei is also championing openness as evidenced by its active participation in open source organizations, such as leading the data protection at OpenStack. Huawei also works closely with partners in building cloud computing-based infrastructures into data centers and creating a more open ecosystem. Fan Ruiqi, President of the Huawei Storage Product Line said, "We are pleased Gartner has named Huawei as a leader in storage. This recognition further solidifies our level of credibility in the industry and with customers. Our products have earned the trust of nearly 6,000 customers worldwide. With our eyes on the future, we are promoting our 'Data on Demand' vision to help more customers better manage their data assets and achieve the needed agility in their cloud transformations." ²Gartner: Magic Quadrant for General-Purpose Disk Arrays, 31 October 2016, Stanley Zaffos et al.